Colorado Democrat Sen. Michael Bennet said Sunday that he is ready to lose his seat if that's what is necessary to pass a health care reform bill. Washington (CNN) – A freshman Democratic senator said Sunday that he will support his party’s efforts to pass health care reform legislation even if that means losing his seat in next year’s midterm elections. “If you get to the final point and you are a critical vote for health care reform and every piece of evidence tells you if you support the bill you will lose your job, would you cast the vote and lose your job?” CNN’s John King asked Sen. Michael Bennet of Colorado on Sunday’s State of the Union. “Yes,” Bennet bluntly and simply replied. 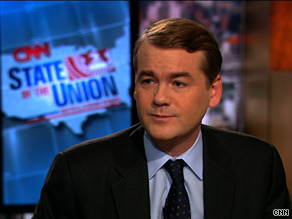 Bennet was appointed by Colorado Gov. Bill Ritter to replace Sen. Ken Salazar, who stepped down from the Senate to serve as President Obama’s Interior Secretary. Bennet, who was superintendent of the Denver public school system prior to his appointment, will have to seek election to the seat for the first time in 2010. Senator Bennett is a true American. Standing up for what is right regardless of the consequences. We need more people like him. health care, retirement even if they are not in office, why should they care. of you care if your friend, relative, or neighbor has health coverage. Government healthcare, b/c they run everything else SO well. Great idea. Jenno-O is right, she lives in his district. His district is the state. And she's also right about Reagan. Americans: stop being so melodramatic. So many negative comments about this bill. It looks like all of you have read the bill when, of course, you get your information straight from the auricles on Fox and other such information sites. Having socialized medicine is wonderful. It's too bad that this bill dos not go far enough for you to benefit fully from such a system. By the time tthe bill passes it probably will not look at all like the original anyway. So, quite whining. jkm	wrote "Question – If it takes a total of 13 – 14 years to become a Surgeon, then why shouldn't the surgeon be able to make more than 250,000 dollars?" Better question: why should *anyone* make 250,000 which is much more than a family needs to support themselves and those they care about, in a country where we 1/6 of the people are going hungry? By the way, it takes 10 years or so to make a professor, but most public universities pay 60,000 to 80,000 dollars. So having a lot of education does not entitle surgeons to outrageous salaries. He is supposed to represent the people of Colorado, he basically is just representing himself. The arrogance of these people is amazing, there is no doubt he will not be re-elected. Politicians seem to forget why they are there, they are not to think for us, they are here to represent us. How about listening to the people? Since you have obviously taken the time to read the 2,000 page monstrosity, kindly point out the sections that talk about tort reform. Why is it that Republicans are so fast to condemn everything the government does as incompetent, and yet they insist on invading other countries to enforce -our way- on others. 1- If the government is incompetent, then the military must be incompetent too. 2- You are running the country, so if it ain't working, then you aren't doing your job. 3- If our country is so dysfunctional, then we have no moral ground upon which to tell other countries what to do. Oh and one more thing.....BRAVO!!! My hats off to the Senator from Colorado. Standing up for what is right regardless of the consequences. We need more people like him. Bless you Senator. I'm constantly amazed by the number of people that don't understand our democracy. People are not elected to vote however their constituents want them to vote. They are elected to act in their constituents' best interest. These two are not always the same thing. There is a tremendous difference between self-interest and enlightened self-interest. Our representatives are ostensibly much more knowledgable about the issues they are voting on than their constituents. It is our representatives duty to vote their conscience, not take a poll and vote however the poll turns out. Great job senator Bennett. Now that's the heart and integrity of a hero. If given a chance, I will contribute to his campaign. If we had more Senators like him we would not be getting this piece of crap legislation they are going to tell the American public is health care reform by the time they water it down to satisfy the Republicans in Democrat clothing. It is nice to know there is at least one rational Senator. If we had 60 of them this game would be over and we would really have something. How can the elected official of a purportedly "representative democracy" (i.e., this person was elected to office to represent his constituents' views) can say that he will vote on any issue in such a way that will cost him his office? Isn't he admitting on Line 1 that he is knowingly choosing to NOT represent the majority of his constituents?! The arrogance of this Democratic party is breathtaking. Any congressperson that supports healthcare reform with a government option, government panel, a new entitlement program or a new tax is foolish and would be voted out of office. A congressperson that looks for solutions in the private sector that includes malpractice reform, that requires more copay and more catastrophic coverage is wise and will win reelection. He probably doesn't have to worry about losing his job. OBlunder will throw him and a great many others under the bus to get what the narcisist in chief what he wants. I say let's throw a huge retirement party for these criminals and just not invite them. The have already led the good life and don't need another party to go to. I want my country back!!! – How about you. VOTE in 2010 and let's begin the healing as well as stiffle the efforts of this Grovelor-in-Chief we have been saddled with. That's what's needed in the Democratic party, BALLS!!!! Mr. Bennet, you and Mr. Grayson from Florida will be getting my donation to make sure you do not lose your job. It's people with principles like you that we need in Washington. Thank you Senator Bennett. You truly believe in the Democratic Party and understand the need for National Health Care, unlike Lincoln, Landieu, Lieberman and Nelson. God Bless you and thank you for your courage! I can't believe anyone is supporting his position. It is a slap in the face to the legislative system. I ask those who are in agreement with Senator Bennet's to answer me one question. How would you feel if the situation were reversed? Let's say Senator Bennet was a Republican and he knew that the majority of the people in Colorado were in favor of the health care bill and he decided that he would vote against it because that is what he believes. I challenge anyone who was agreed with Senator Bennet and his "moral stand" to come and say that they would support him if his position were reversed. I think it is safe to say that we won't see anyone doing that. Finally an elected official with some cajones. I'd write effusively about how we need more politicians like Mr. Bennet–people with serious decisions to make who are willing and able to ignore the constant hyperbolic crap that passes as 'citizen journalism' and 'new media'. I'd add my comment just to encourage him and others like him. But, thankfully, he probably doesn't much care what a bunch of commentiers, facebloggers, and twitsters think ... and he shouldn't. Good for him! Well, the only reason for him not to get re-elected it that people would be un-happy with his voting record. Therefore, is Health Care Reform in this manner really what the PEOPLE want? All of these republicans that are saying that this is going to cost too much, raise the debt, raise taxes etc etc. all of that stuff happened when your guy was in– George W Bush. Just because your company offers health care coverage now doesnt mean that they can't change their minds tomorrow. Come on people, we all know that these companies we work for can drop coverage at the drop of a hat. Then What? This is coming from the party that wanted to privatize social security. Glad that plan didnt work.